To enhance the characteristics of lithium-ion batteries, elucidation of how batteries deplete and structural analysis of how positive and negative active materials, which are major components of batteries, degrade are essential. However, parts of each battery component are made up of very active substances including lithium, whose states would change if they are handled in the atmosphere. To maintain the their states that they are in the battery during analysis, we have created a system that allows for all processes from disassembly of batteries to pre-treatment, transfer to analytical equipment, and analysis procedure in the absence of air. This article presents some examples of such analysis. Disassembly of batteries, cleaning of electrodes, and other pre-treatment processes are performed in the glove box, in which temperature and the oxygen concentration are maintained at -60oC or below and 10 ppm or below, respectively, in argon atmosphere. After a battery is disassembled in the glove box, its electrode components are put in transfer containers for each analysis system that are tightly closed with argon gas. Each container is transferred to each analysis system and attached to its loader, and then the electrode component is moved into the analysis system. Figure 1 shows results of XPS of the negative electrode removed from a degraded Li-ion battery for mobile phones—batteries described in this article were all discharged. For comparison, results of analysis in air are also shown. The positions of the Li 1s photoelectron spectrum are different between the analyses in the presence/absence of air, indicating that the chemical state of Li has changed. This result, combined with those from the photoelectron spectra of C 1s and O 1s, suggest that oxide, hydroxide, fluoride, and other complex compounds of Li in the absence of air mostly altered to Li2CO3 in the presence of air. As shown in this example, it is obvious that components of the negative electrode undergo alteration in the presence of air. Therefore, analysis in the absence of air is indispensible to inhibit alteration. 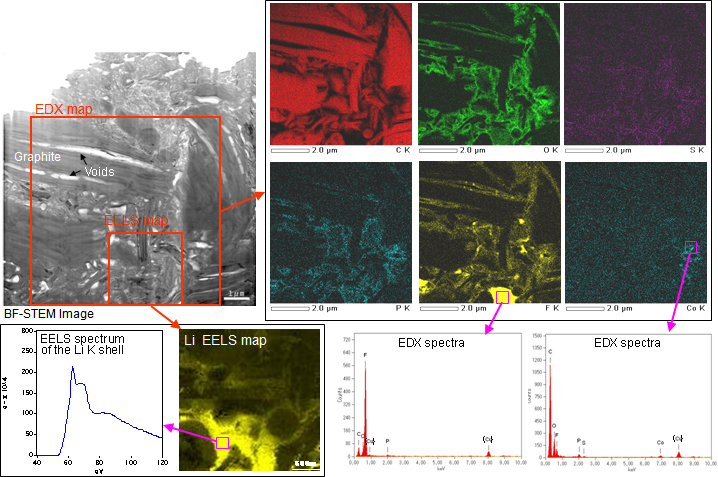 Reflection EELS provides smaller changes such as oxidation and bonding of specific elements on the specimen surface by measuring photoelectrons that are emitted from the specimen exposed to an electron beam. We have our proprietary system that has been optimally designed to reflection EELS. 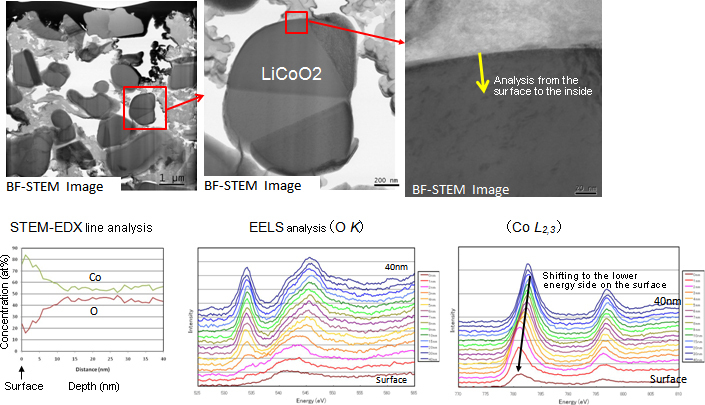 Figure 2 shows comparison of reflection EELS of core loss spectra of Co in LiCoO2 used in the positive electrode for a Li-ion battery in the presence and absence of air. The entire peak of the spectrum of Co in the presence of air is broad, suggesting that the specimen surface has reacted with compounds such as water and CO2 and consequently presents a mix of various states. Figure 3 compares spectra of the positive electrode taken out of normal and depleted batteries. A new peak of Co emerged at the higher energy side because of depletion, suggesting an increase in the valency of Co that is consistent with a general view that a depleted battery loses Li and has increased Co oxide. Observation of positive and negative electrodes using TEM requires preparation of a thin film specimen using a focused ion beam (FIB) system. We modified the specimen inlet of our FIB system and created an air-tight specimen holder so that a series of specimen preparation processes can be performed in the absence of air. Figure 4 shows TEM images of the vicinity of the surface of positive active material LiCoO2. Energy dispersive X-ray (EDX) quantitative line analysis indicates that the oxygen concentration of the specimen surface decreased. Shift of the L shell absorption edge of Co found by EELS indicates that the valency of Co has decreased on the surface of the positive active material. 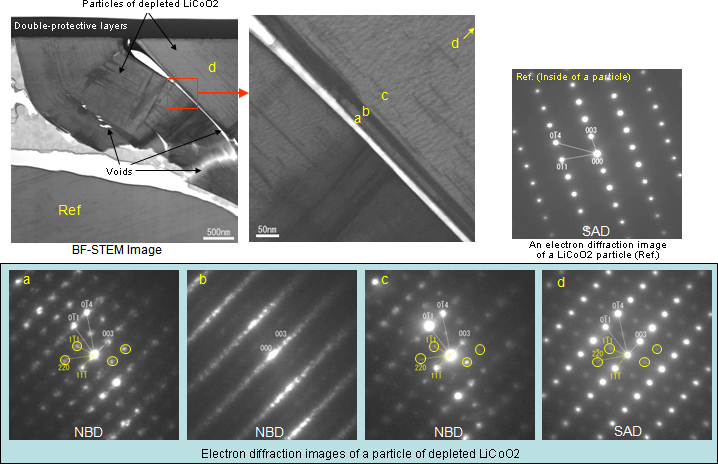 Figure 5 shows TEM images of particles of LiCoO2, the positive active material taken out of a depleted battery. Analysis of electron diffraction images indicates that LiCoO2 hexagonal. Depletion caused generation of voids along Side C of the hexagonal crystal. An electron diffraction image of the vicinity of the void surface shows streaks along Side C, indicating the presence of lattice defects. TEM images of the negative active material of the depleted battery in Figure 6 show that voids were generated in graphite of the negative electrode. EDX mapping indicates that there is a layer of reaction products. Combined with EDX, EELS determined in what state Li existed, namely LiF. 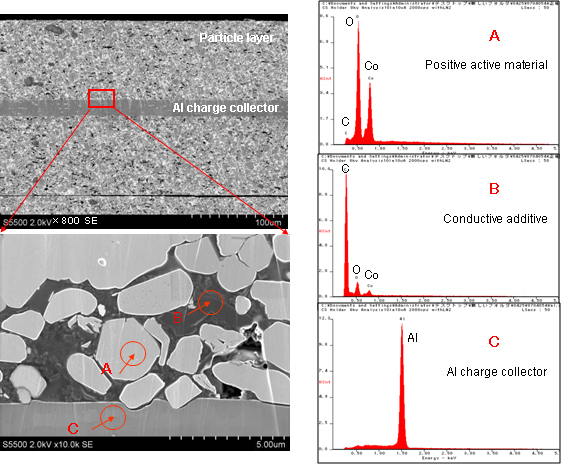 Figure 7 shows SEM images of the surface of the negative electrode of a depleted battery. Deposits are present on the electrode surface. 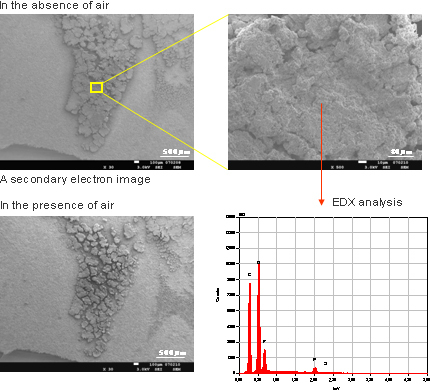 EDX indicates that the electrode surface got cracked and oxidized when it was exposed to the air. SEM images of a cross section of the positive electrode, which was treated using a cross-section polisher while it was exposed to the air, are shown in Figure 8. SEM enables analysis of the morphology and distribution of positive active materials and conductive additives, as well as investigation of clogging and deformation of the separator. In addition to the examples described here, our systems for Auger electron spectroscopy (AES) and glow discharge spectroscopy (GD-OES) are compatible with analysis in the absence of air. Further we are developing a technique that combines cross-section fabrication by diagonal cutting with surface analysis. We at Kobelco Research Institute hope that our unique analysis techniques in the absence of air will help analyze depleted Li-ion batteries and develop high-function batteries. We are also planning to apply our techniques to analysis of surface-active materials such as organic electroluminescent devices and catalysts.